*Unless we identify an error we will use this time schedule throughout the event. Unless we experience some delays or are compelled by weather to speed up the event we will attempt to stay as close as possible to this schedule. Wednesday Updates: Wednesday Updates - These are also being sent via email. Opportunity to donate new shoes at Eastern Relays this Saturday! There will be a new way for the track and field/XC communities to give forward at selected meets starting this season and continuing into future years. The Giving Shoe Tree will make its debut at some meets (Starting with Eastern Relays this Saturday with designated bins to drop in your donated shoes) as a mission to give new shoes or very gently used shoes of all types through UCCS (Uganda Christian Counseling Services) as a way to share in both Uganda and even people in Appalachia and other areas. This project is more about sharing than just shoes. Click on the link below if you would like to see more about The Giving Shoe Tree and its beginning earlier this year. Registration note for Indiana Schools. Several Indiana coaches have reached out with some concerns about the IHSAA sanction for the Eastern Relays. Be aware that we are working diligently and have been in consistent communication with the IHSAA to ensure that all IHSAA schools will be eligible for participation. We have limited entries to schools from IN, TN, WV, IL, MO, KY, and OH and all school meet the 300 mile range from the Indiana border. We are excited about an AWESOME field of registrants from this region. The 2018 Eastern Relays Featured some remarkable, national class, performances. The meet features 176 performances rated as nationally elite on Milesplit! The 3200m is always a highlight and 2018 did not disappoint. The girls race featured an amazing final lap with local greats Kaitlyn Lacy (Male, KY) and Kathleen Sims (Manual, KY) fighting down the stretch. Lacy ran 10:33.62 to beat Simms 10:34.52. They led All-American Taylor Ewert (Beaver Creek, OH), 10:38.41 and 8 total girls under 11:00. A total of 44 girls broke 12:00. The boys 3200m was remarkable from start to finish. The star-studded field had an agenda to run fast from the gun. Dustin Horter (Lakota East, OH), Titus Winders (Henry Co, TN), Chad Johnson (Col. Crawford, OH) , Zach Kreft (Bouckeye Vally, OH), and Matt Scrape (Pick. Central, OH) all had a mission to chase sub-9:00. The result was one of the nation's best races. Horter ran the fastest regular season time of the year at 8:48.62 and the result were the 2nd, 4th, 7th, 25th, 33rd best times with all 5 breaking 9. Young Silas Winders (TN) finished in 9:01.85 and was the nation's 3rd fastest soph on the season. There were 22 boys under 9:30 and 82 under 10:00. The 2018 meet saw sprint relays set records in the boys and girls 4x100m and boys 4x200m. The boys of Henry Clay (KY) ran 41.83 and the ladies from Tates Creek (KY) ran 47.07 to take over a second off the old meet record. The Rock Bridge (MO) boys ran 1:27.74 to set the meet record in the 4x200m. Rock Bridge also doubled up to win the 4x400m in 3:20.18. Madison Martinez (Gahanna Lincoln, OH) ripped a 2:12.12 800m to take that meet record. She led Breanna Alderton 2:13.79 (Owensboro, KY) and Phoebe McCowan 2:14.79 (South Laurel, KY) under 2:15. 9 ladies broke 2:20 in a deep race! J'Alyiea Smith (Withrow, OH) ran 42.91 to set the 300m Hurdle Record beating OH state champ Angel Gazaway (Princeton, OH). J'Alyiea also won the High Jump in 5'6. Too many highlights to mention them all. Trevor Warren in the Mile, Langston Jackson in the 100m, two 15' vaulters, Bryan Hudson in the shot, two 37' ladies TJers, and 8 girls under 5:10 in an awesome mile race. All entries must be submitted electronically using the entry portal at http://easternrelays.milesplit.com. It is important that valid results for your team are included on the milesplit database. If any of your meets are not included in the milesplit database please send digital results to your state's milesplit editor or kymilesplit@gmail.com. Teams may enter all athletes who meet the entry marks, and all may score. Note, qualifying marks will not be accepted from meets that do not produce digital results. Coaches may enter any athletes who have a verifiable PR (lifetime best indoor or outdoor) in the milesplit database that meets the qualifying standard. Those not meeting the mark will not be allowed to compete in the invitational events. Open running events are open to all performers and require no qualifying standards. Open field events do have an entry standard. All participating teams may enter one relay in each Saturday relay event. For the Friday Relays we plan to only accept 1 section of the DMR and 2 sections of the SMRs. If we receive entries beyond the goal field size, teams will be selected based on quality using both relay performances and individual performance. Final decisions are at the discretion of meet management and will be determined after the entry period is closed. Distance Races (800m and above) will all use a one turn stagger and either laned starts or alleys. We are contesting Mile races, not 1600m races. Fastest sections for all distance events may be slightly smaller than subsequent sections. The 4x400m will use a 3 turn stagger. All running events will run fast section to slow section based on seed, all events will be timed finals, no prelims. Laned events will use 9 lanes. Our open events are designed for varsity or high level JV athletes who did not meet our invitational entry standards. These races are very competitive and yield excellent performances. All open field events (Pole Vault, Long Jump, Triple Jump, Shot Put, and Discus) take place at UofL's Card Park on Friday and require meeting qualification marks. On the entry page there is not a separate place for open field events. Just enter the open athletes along with the invitational athletes and we will split the field after the entry window closes. Friday's Open running events (100m & Mile) are at UofL's Cardinal Park Track and teams are limited to 3 entries per event in those races.The Open Mile is listed in the entry page as 1600m but will be a Mile. 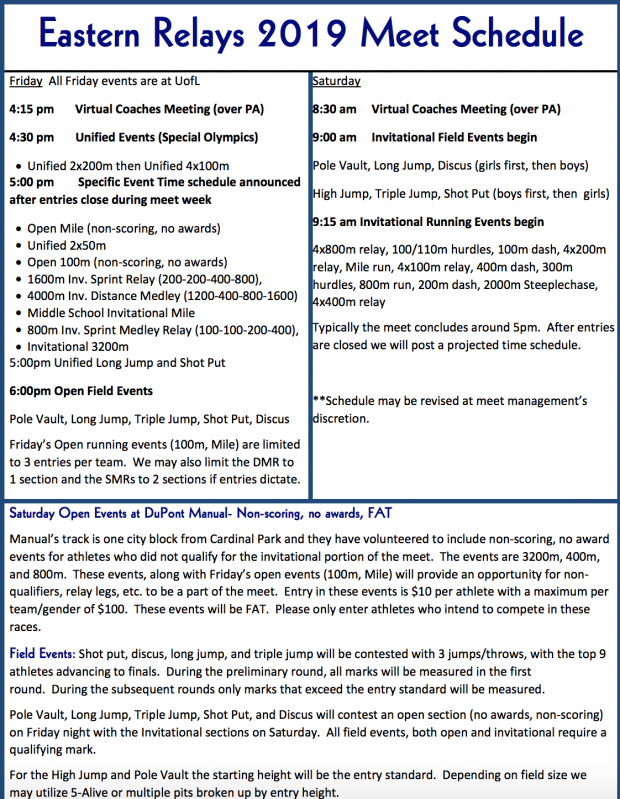 Saturday's Open Running Events (400m, 800m, 3200m) are contested around the corner at DuPont Manual. All entries should be based on lifetime best marks including both indoor and outdoor performances. If you are having trouble please begin by emailing your state's milesplit editor (contact info for your state is at the bottom of your state's milesplit page). If you have any persistent issues that your state editor cannot resolve, please contact Meet Director Mike Horan (michael.horan@jefferson.kyschools.us) and KY editor Chris Hawboldt (kymilesplit@gmail.com). We love our DMR and both SMR events on Friday night but the seeding can be tricky since many teams do not race it before Eastern Relays. Remember, we plan to limit the DMR to 1 section per gender so seed times don't matter too much, but please be thoughtful in the quality of team's you are entering. For the SMR, after entries close and the performance list comes out, if you think your SMR is seeded in the wrong section please email with evidence that your team should be upgraded. As meet information indicates we may limit the size of all medley relays based on quality if the field size dictates. Every school with a team entered in the meet may race in all of the Saturday Relays. There is no required qualifying time. Please include all relay legs and alternates in the entries. Please make every effort to get entries in sooner rather than later. The deadline is Midnight on Monday but getting things in earlier will allow any questions on the entry process to be answered in a timely fashion. We do not expect to add entries after the deadline as our field will be quite large. Please look to meet information links on http://easternrelays.milesplit.com before emailing a question. We will have well over 100 teams participating in the meet. Sanctioning: We typically proactively complete the sanctioning process for KY, IN, OH, IL, MO, WV, and TN. Any schools from additional states wishing to participate should communicate early so you can also be included. Last year Indiana's sanction required that they be scored in a separate division so IN teams were ineligible for team awards. Entry deadline: Online entries should be received by Monday April 15th, 2019. Any entries received after the deadline will be charged an additional $25 fee and may not be accepted at all. All athletes (including relay legs) are assigned a unique competitor number. There will be a $5 fee for athletes that lose their bib numbers or that are not included in the entries and need to be assigned a competitor number/bib on meet day. Track Events: All track events are timed finals. Field Events: Shot put, discus, long jump, and triple jump will be contested with 3 jumps/throws, with the top 9 athletes advancing to finals. During the preliminary round, all marks will be measured in the first round. During the subsequent rounds only marks that exceed the entry standard will be measured. Pole Vault, Long Jump, Triple Jump, Shot Put, and Discus will contest an open section (no awards, non-scoring) on Friday night with the Invitational sections on Saturday. All field events, both open and invitational require a qualifying mark. For the High Jump and Pole Vault the starting height will be the entry standard. Depending on field size we may utilize 5-Alive or multiple pits broken up by entry height.